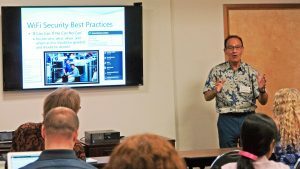 Over 30 separate Maui-owned small businesses were represented at three free workshops held at the Maui County Business Resource Center in Kahului on Jan. 3 and 9, 2019. Attendees at the event ranged from specialty food providers to nonprofit directors of radio and music organizations to financial and accounting consultants to startup businesses in health and well-being to mom-and-pop retail establishments. Small business owners attending the Rock Your Business in 2019 event learned about writing successful press releases, setting up personalized WiFi systems and standards for their businesses, and strategies for how to integrate business core values into marketing, sales and customer service standards. In the afternoon, attendees heard a panel presentation, “Be a Champion of Marketing, Sales and Customer Service” with Debra Finkiewicz, owner of Maui Closet Company; Diane Haynes Woodburn, publisher of Maui Nō Ka ʻOi magazine; and Alyson Winters, district manager of Food Pantry; with tips for how to create a lasting and consistent experience across marketing, sales and customer service engagements. 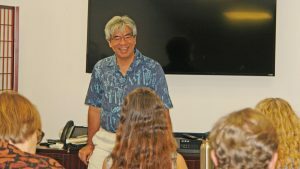 Lee Imada, managing editor of The Maui News, gave a presentation on how business can write effective press-releases. PC: MBB. Imada kicked off the event’s lineup with his talk, “Be the News,” advising local business owners to look for the “win-win” blend of news value combined with business highlights when submitting press release materials for publication. He urged attendees to “think about the interests of the community” when positioning their messages for local news media. As he emphasized, a press release is not a free ad; instead “a news release must be news.” Attendees returned to their jobs with a practical list of do’s and don’ts and an example of a press release submission before and after publication. Local technology expert Joseph Bardwell gave a presentation on how to effectively set-up a WiFi system that specifically caters to your business’ needs. PC: MBB. Bardwell, in his technology session on setting up Wi-Fi systems and standards for small businesses, guided the attendees through a process to define “what is good Wi-Fi?” After explaining the many options, standards, and ranges of services available, Bardwell’s ultimate answer at the end of the session is that good Wi-Fi is Wi-Fi that meets a particular business’s specific criteria and needs, in a unique combination for each individual business. Bardwell provided attendees with clear understandable information about what those options and choices are, so the business owners can make decisions to best adapt technology to the needs of their specific business operation. 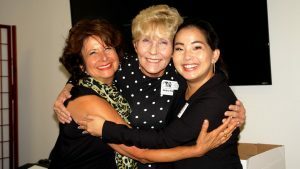 Diane Haynes Woodburn, publisher of Maui Nō Ka ʻOi magazine; Debra Finkiewicz, owner of Maui Closet Company; and Alyson Winters, district manager of Food Pantry; presented on marketing, sales and customer service strategies. PC: MBB. In the afternoon panel discussion “Be a Champion of Marketing, Sales and Customer Service,” Winters first addressed setting and upholding customer service standards, followed by Woodburn, who gave examples of the marketing principles she has applied throughout her career, and Finkiewicz concluded with an approach to adapting sales techniques to specific customer styles. The three women noted the interplay of customer service, marketing and sales in a successful business. Winters of Food Pantry began by talking about the challenge of keeping good employees, which can be key to creating a consistent customer experience. She noted that there is both a benefit of good customer service and a negative impact from poor customer experiences. She described her role as manager at a retail establishment by saying “I’m here to be part of the aloha experience,” adding that she trains her employees to realize that “you are a part of every visitor’s journey.” Winters emphasized defining core values of a business that drive customer service standard behaviors and used examples to advise attendees to be very specific about what those behaviors look like on the job. Publisher Woodburn focused on the importance of “knowing who you are as a business,” noting that “as you change how you market, you still need to stay true to your goals and identity.” She used the example of her business mantra for Maui Nō Ka ʻOi magazine, which is “for the love of Maui” and ways that the mantra influenced a variety of business decisions over the years. Rock Your Business in 2019 concluded on Wednesday, Jan. 9, with two final free workshops at the Maui County Business Resource Center in Kahului. “Tune-up Your Legal Fine-Print; then, Get that Contract Signed,” covered the basics of business structures, agency, and contracts, in a workshop specially designed for entrepreneurs, startups and small businesses. “Build Business Trust By Opening Up” explored branding and the bounds between personal and professional identity. For more information, email organizers@MauiBusinessBrainstormers.org  or go online .